In the end of the last week, Euro rebounded from the level of 61.8%. We can’t exclude a possibility that this level may become a starting point for a new descending movement. If the bears are able to keep the price below the level of 38/2%, the market will continue moving downwards. At the H1 chart, a local correction is taking place. If the price break the latest minimum, I’ll increase my short positions. The target is still at the level of 1.2650, where there are several fibo-levels. Last Friday Franc rebounded from the level of 50%. However, the bears aren’t going to give up and right now they are testing this level again. If the pair rebounds from it, the price will start a new ascending movement towards the target area. 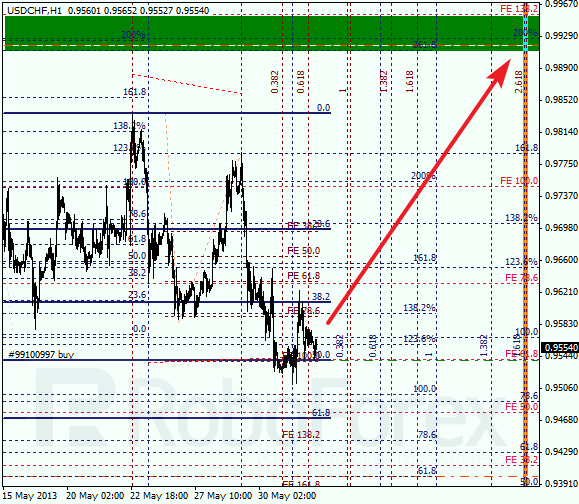 As we can see at the H1 chart, the pair is consolidating. If the price rebounds from the level of 50% for the second time today, it will take Franc the whole week to continue growing up towards the upper targets. According to the analysis of the temporary fibo-zones, the target area may be reached in the beginning of the next week.